WriteTrackED is a user-friendly report writing and caseload management tool. 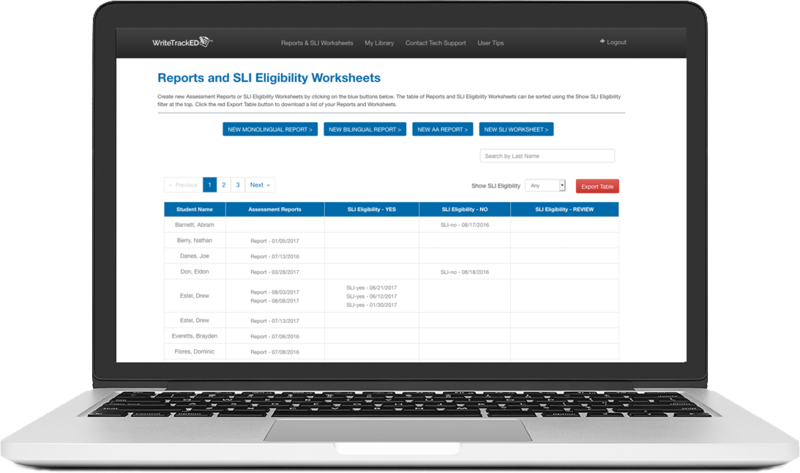 Designed by SLPs and School Administrators, WriteTrackED simplifies and streamlines the report writing process, identifies and tracks SLI eligibility, and manages caseloads and IEP calendars. What Can WriteTrackED Do For You? Go Digital! WriteTrackED puts technology to work for you, with modern tools and resources, designed specifically for school-based SLPs. I’m an SLP. More Home. Less Work. I’m an Administrator. Put Your Bottom Line on the WriteTrackED. "In my experience, WriteTrackED provides an efficient way to create school-based reports. The program streamlines the whole report writing process. The administrators’ tools are helpful and allow for easy viewing of SLI eligibility by age-level, by disability, and you can see which students may be ready for exit." "WriteTrackED is a great resource for me as an SLP. It really helps me manage my caseload and efficiently write a report. It has been helpful having resources exactly where I need it, when I need it." Single repository for all SLI information." WriteTrackED offers the professional development your SLPs need to understand SLI eligibility, and the legal guidelines for special education evaluations, while providing the resources they need to avoid the most common (and costly!) assessment errors. Administrator tools allow for real-time viewing of speech-language reports, SLI worksheets and caseloads, as well IEP and therapy calendars. No more tracking down documents – everything is at your fingertips. Did you know that SLPs spend an average of 7 hours each week on documentation? Are you tired of formatting, cutting and pasting, using old Word doc templates for your reports? WriteTrackED was designed to modernize the assessment and report-writing process by giving SLPs access to over 50 pre-programmed English and Spanish test descriptions and tables. Drop down menus, customizable test results tables and links to online scoring allow SLPs to take back their precious work time. Live IEP and therapy calendars can be viewed and downloaded with a click of button and WriteTrackED’s caseload features allow SLPs to manage their students and documentation all in one place.